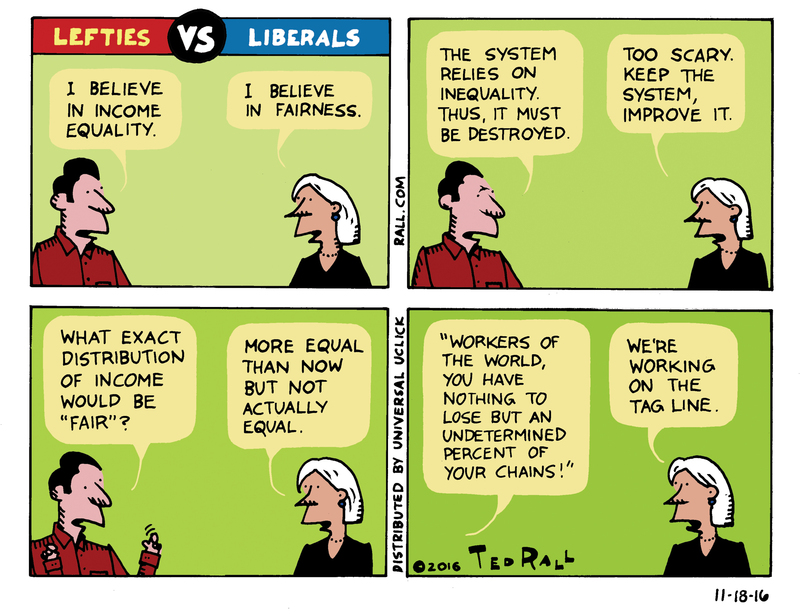 Liberals have a problem: the kinds of redistribution they advocate and support just don’t do a lot to fundamentally alter the profoundly unequal distribution of income in the United States. Consider the chart above, which illustrates the cash-income effects of the U.S. tax system (with dark colors marking the pre-tax distribution of income and the lighter colors the post-tax distribution). The results are quite meager: in 2014, the share of the top 1 percent (blue lines, measured on the right) was only lowered from 20.2 percent to 17 percent, while the share of the bottom 90 percent (plum lines, measured on the left) rose from 53 percent to just 59.2 percent. So, even after all the tax-based redistributions are completed, the top 1 percent still ends up with a larger and larger share of income—and the share left over for the bottom 90 percent continues to fall. All of that political fighting over tax rates and government programs to ameliorate the unequalizing effects of American capitalism and that’s all we end up with. It should come as no surprise then that Isabel Sawhill [ht: ja] concludes that changing the tax structure, even radically, won’t really change much. Sawhill’s analysis of both the political hurdles and the limited benefits of progressives’ favorite tax-and-spend schemes is certainly accurate. Existing economic institutions produce such an obscenely unequal distribution of income in the United States that it’s difficult to envision any political feasible changes in the tax structure that will bring down inequality into a region that progressives would consider fair and just. It means paying attention not just to shareholders but also to workers, customers, and the community. It has proven to be a successful strategy for many companies. They have showcased what can be accomplished when the private sector takes greater responsibility for helping workers—whether in the form of profit sharing, training, or providing benefits such as paid leave and flexible hours. The fact is that without such an approach, it will be difficult to achieve broadly based economic growth. It would simply require too much redistribution after the fact. We need instead to test the limits of equalizing the distribution of market incomes before taxes and benefits enter the picture. And perhaps Sawhill and other American liberals can convince employers to become “high-road,” stakeholder employers instead of taking the “low-road” of the shareholder economy. 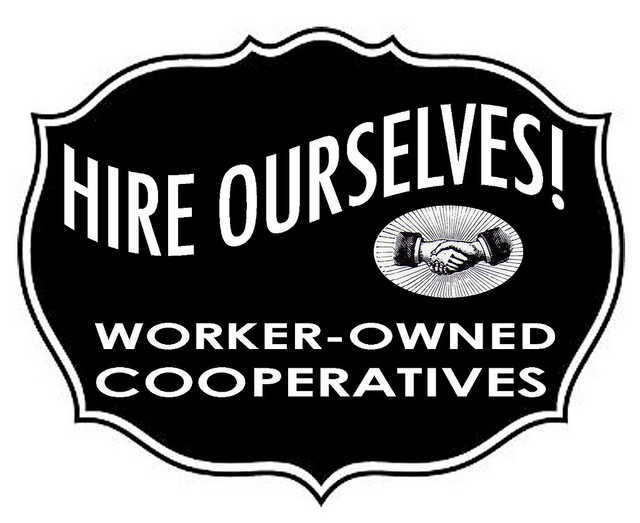 I’m thinking, for example, of worker cooperatives and other kinds of enterprises owned by workers and the communities in which they live. If we think the existing distribution of income is fundamentally unjust and redistributive efforts are generally limited and ineffective—both of which are arguments that Sawhill herself makes—then why not focus on ways of actually improving the initial distribution without requiring the assent of existing employers? The advantage of worker- and community-owned enterprises is they include the stakeholders from the very start. The stakeholders are the ones who decide how the firms will be organized, what the workers will be paid, how the surplus funds will be allocated, and so on. And from all the existing examples we have, from Cleveland’s Evergreen to Spain’s Mondragón, the initial distribution of income would be much more equal than anything we’ve seen, not only in the past few decades, but over the entire modern history of the United States. Then, on top of that, people might want to have a tax-based redistributive scheme—for example, to correct for differences in enterprise success, regional discrepancies, and so on. But such redistribution would be much easier and more effective than anything Sawhill and others envision for the United States today. It just wouldn’t have an enormous mountain of inequality to dismantle. So, while I agree with Sawhill that “our failure to achieve anything close to broadly based economic growth in the United States is very troubling,” I want to expand the discussion and see a much bigger role for alternatives to capitalism in distributing the rewards to workers and the members of the communities in which they live. That one change, in the direction of more worker- and community-owned enterprises, can serve as the basis of an economy that would produce an array of incomes that brings us much closer to an initial distribution that many progressives consider fair and just. Too often “the economy” is equated with markets where corporations compete to make profits for the wealthiest 1 percent and the rest work for a wage or salary (or don’t make money at all). . .
To escape this “capitalocentrism,” we need to broaden the definition of economy beyond capitalism. 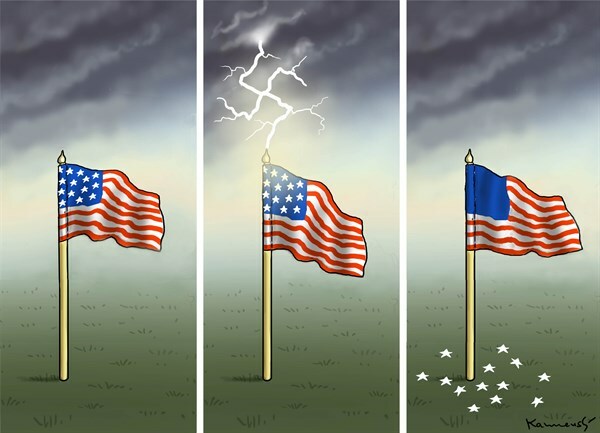 This semester, we’re teaching A Tale of Two Depressions, a course designed as a comparison of the first and second Great Depressions in the United States. And one of the themes of the course is that, in considering the conditions and consequences of the two depressions, we’re talking about a tale of two countries. 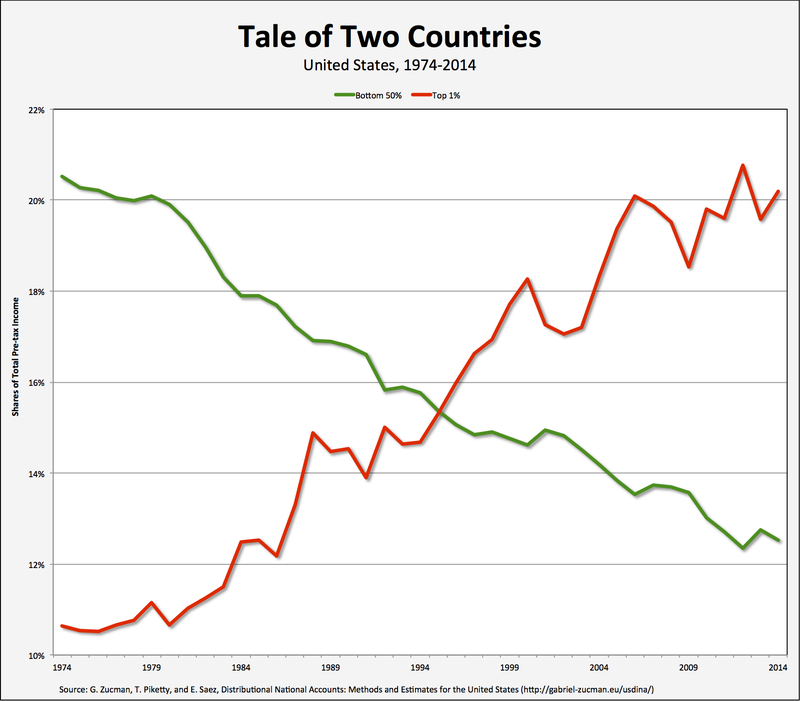 As it turns out, the tale of two countries may be even more true in the case of the most recent crises of capitalism. That’s because the two countries were growing apart in the decades leading up to the crash—and the gap has continued growing afterward. It seems we learned even less than we thought about the first Great Depression. 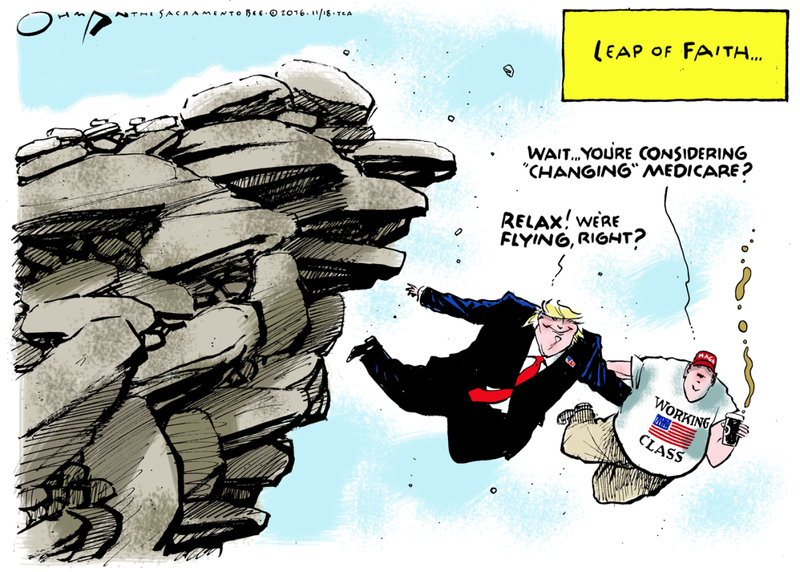 Or maybe those at the top learned even more. Because the pre-tax incomes of the bottom 50% stagnated while average national income per adult grew, the share of national income earned by the bottom 50% collapsed from 20% in 1980 to 12.5% in 2014. Over the same period, the share of incomes going to the top 1% surged from 10.7% in 1980 to 20.2% in 2014. 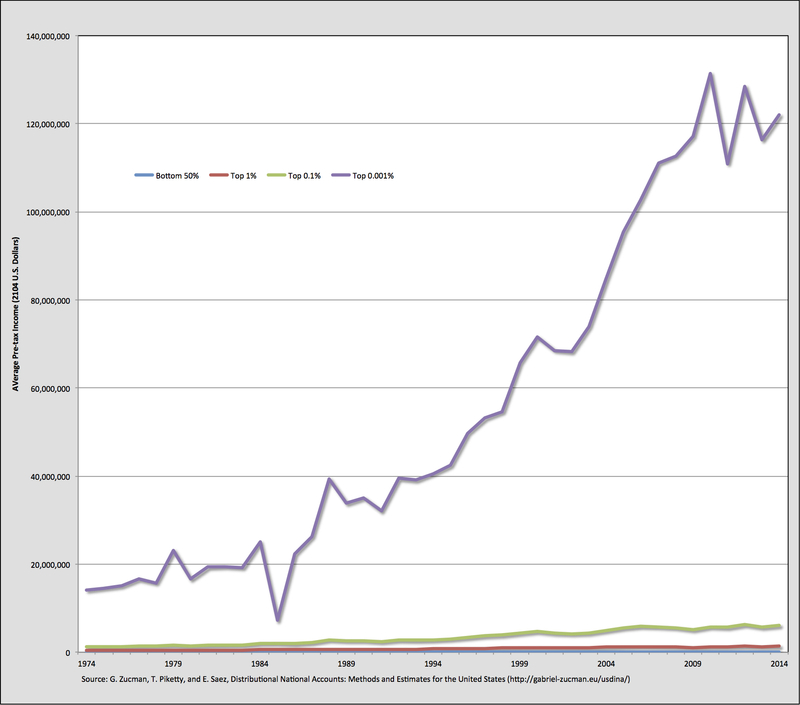 What is clear from the data illustrated in the chart at the top of the post, these two income groups basically switched their income shares, with about 8 points of national income transferred from the bottom 50 percent to the top 1 percent. The consequence is that the bottom half of the income distribution in the United States has been completely shut off from economic growth since the 1970s. From 1980 to 2014, average national income per adult grew by 61 percent in the United States, yet the average pre-tax income of the bottom 50 percent of individual income earners stagnated at about $16,000 per adult after adjusting for inflation, which barely registers on the chart above. In contrast, income skyrocketed at the top of the income distribution, rising 205 percent for the top 1%, 321 percent for the top 0.01%, and 636 percent for the top 0.001%. Trickle-up economics, by any other name. . . 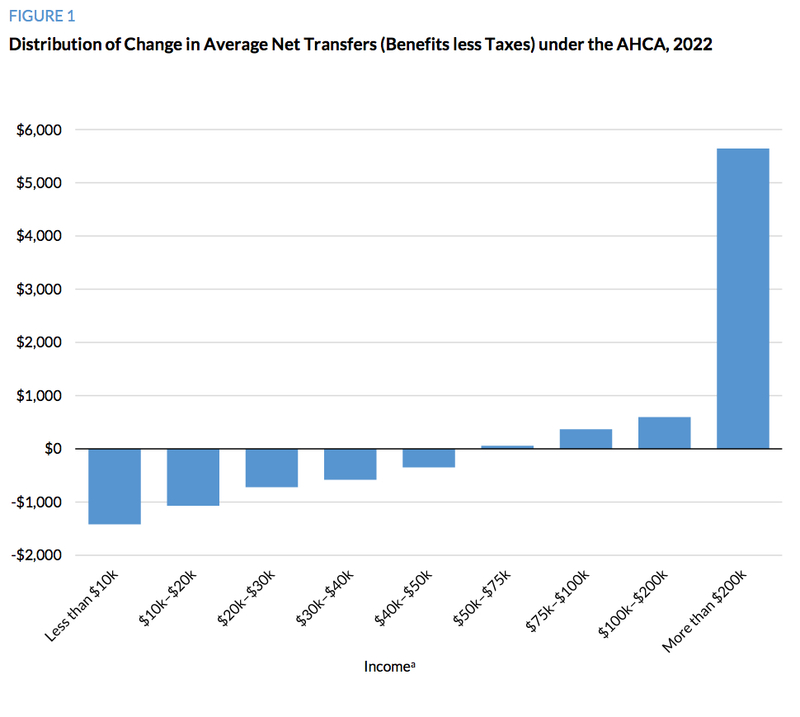 Upper-income families would receive net benefits from the tax and spending changes proposed in the AHCA, and lower-income families would experience net losses. Higher-income families benefit the most from the tax cut, with 70.6 percent of the tax reductions in 2022 received by those with incomes over $200,000 and 46.2 percent of the tax reductions received by those with incomes over $1,000,000. Reductions in federal funding for health benefits would hurt lower-income families the most; families with incomes below $30,000 would sustain more than three-quarters of the losses in benefits. Taking both tax and benefit changes into account, the largest average gains under the AHCA would go to those with the highest incomes ($5,640 on average for those with incomes over $200,000), and the largest average losses from the AHCA would go those with the lowest incomes. In the end, it all comes down to the theory of value. 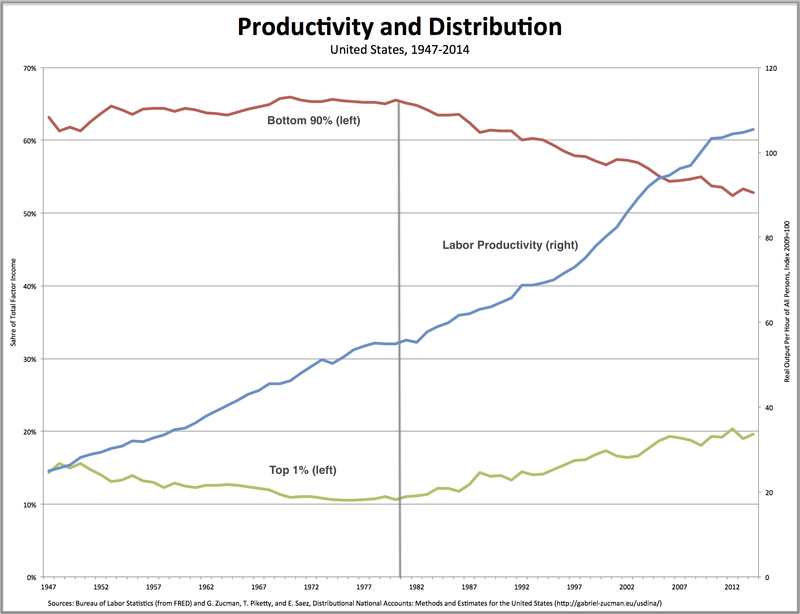 That’s what’s at stake in the ongoing debate about the growing gap between productivity and wages in the U.S. economy. Robert Lawrence tries to define it away (by redefining both output and compensation so that the growth rates coincide). Robert Solow, on the other hand, takes the gap seriously and then looks to rent as the key explanatory factor. 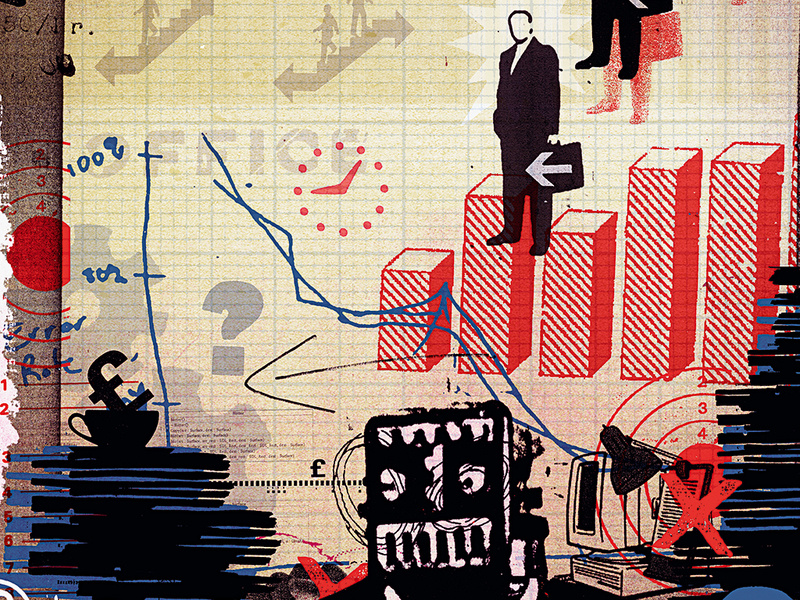 Until recently, when discussing the distribution of income, mainstream economists’ focus was on profit and wages. Now, however, I’m noticing more and more references to rent. What’s going on? My sense is, mainstream economists, both liberal and conservative, were content with the idea of “just deserts”—the idea that different “factors of production” were paid what they were “worth” according to marginal productivity theory. And, for the most part, that meant labor and capital, and thus wages and profits. The presumption was that labor was able to capture its “just” share of productivity growth, and labor and capital shares were assumed to be pretty stable (as long as both shares grew at the same rate). Moreover, the idea of rent, which had figured prominently in the theories of the classical economists (like Smith and Ricardo), had mostly dropped out of the equation, given the declining significance of agriculture in the United States and their lack of interest in other forms of land rent (such as the private ownership of land, including the resources under the surface, and buildings). Well, all that broke down in the wake of the crash of 2007-08. Of course, marginal productivity theory was always on shaky ground. And the gap between wages and productivity had been growing since the mid-1970s. But it was only with the popular reaction to the problem of the “1 percent” and, then, during the unequal recovery, when the tendency for the gap between a tiny minority at the top and everyone else to increase was quickly restored (after a brief hiatus in 2009), that some mainstream economists took notice of the cracks in their theoretical edifice. It became increasingly difficult for them (or at least some of them) to continue to invoke the “just deserts” of marginal productivity theory. The problem, of course, is mainstream economists still needed a theory of income distribution grounded in a theory of value, and rejecting marginal productivity theory would mean adopting another approach. And the main contender is Marx’s theory, the theory of class exploitation. According to the Marxian theory of value, workers create a surplus that is appropriated not by them but by a small group of capitalists even when productivity and wages were growing at the same rate (such as during the 1948-1973 period). 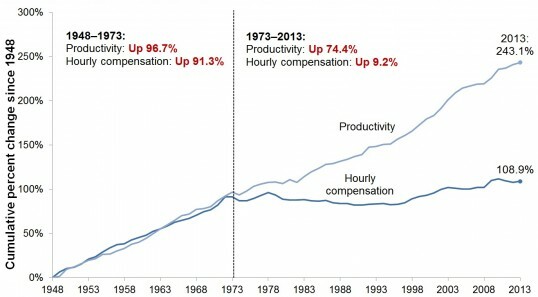 And workers were even more exploited when productivity continued to grow but wages were stagnant (from 1973 onward). That’s one theory of the growing gap between productivity and wages. But if mainstream economists were not going to follow that path, they needed an alternative. That’s where rent enters the story. It’s something “extra,” something that can’t be attributed to either capital or labor, a flow of value that is associated more with an “owning” than a “doing” (because the mainstream assumption is that both capital and labor “do” something, for which they receive their appropriate or just compensation). According to Solow, capital and labor battle over receiving portions of that rent. The suggestion I want to make is that one important reason for the failure of real wages to keep up with productivity is that the division of rent in industry has been shifting against the labor side for several decades. This is a hard hypothesis to test in the absence of direct measurement. But the decay of unions and collective bargaining, the explicit hardening of business attitudes, the popularity of right-to-work laws, and the fact that the wage lag seems to have begun at about the same time as the Reagan presidency all point in the same direction: the share of wages in national value added may have fallen because the social bargaining power of labor has diminished. The problem, as I see it, is that Solow, like all other mainstream economists, is assuming that profits, wages, and rents are independent sources of income. The only difference between his view and that of the classicals is that Solow sees rents going not to an independent class of landlords, but as being “shared” by capital and labor—with labor sometimes getting a larger share and other times a smaller share, depending on the amount of power it is able to wield. the alleged sources of the annually available wealth belong to widely dissimilar spheres and are not at all analogous with one another. They have about the same relation to each other as lawyer’s fees, red beets and music. 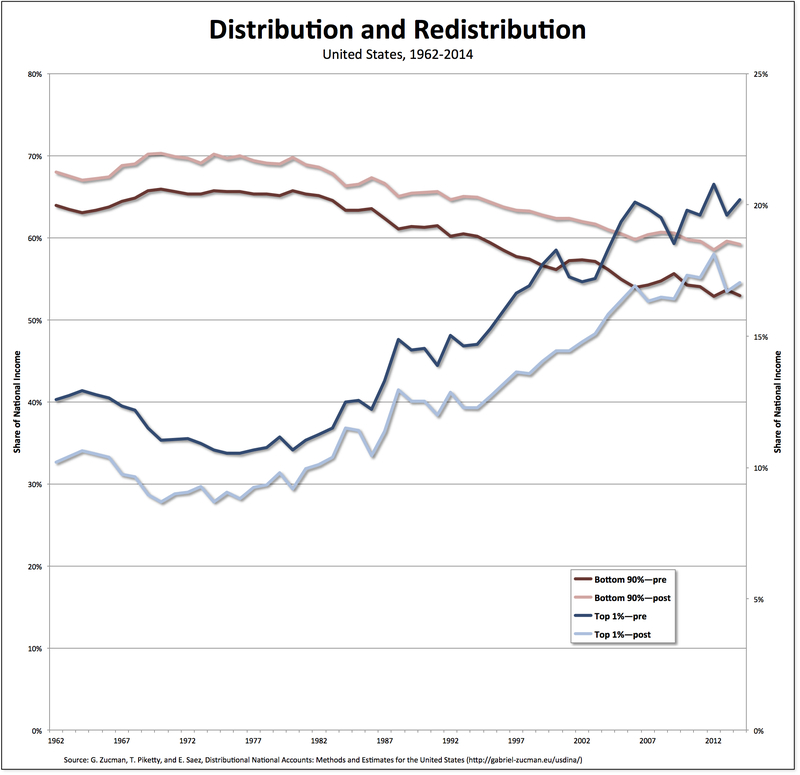 Robert Solow is probably right: government redistribution of income hasn’t had much of an effect on existing inequalities in the United States. So, it’s time to try something else. To the extent that widening inequality is caused by the yawning gap between the epicurean pay deals in the executive suite and the stagnant wages paid to those on the shop floor, it might best be addressed at the level of the corporation, not by government. . .
One way of changing corporate governance is to let the employees participate in determining how firms are run. It’s likely, if the major decisions in corporations were made by the workers, we’d see less much less inequality and more investment in the things that matter, such as hiring the unemployed, improving job safety, and expanding community services for workers and their families. That kind of change in corporate governance would also increase the possibility that more of the determination of income would be taken out of the market and improve the ways the government redistributes income. In other words, a fundamental change in corporate governance would likely improve both the distribution and redistribution of income.